In 2016 WordPress is the most popular content management system (CMS) used for building websites (as it has been for many years now). And WooCommerce, a plugin for WordPress, is the most popular platform used for building eCommerce websites. WordPress is used to power over 25% of the world’s ten million largest websites and over 59% of all websites using a CMS. WooCommerce was developed initially as Jigoshop. Subsequently Jigoshop was forked and significantly enhanced into WooCommerce by WooThemes. In May 2015 it was acquired by Automattic. Alignable has prepared an SMB Trust Index based on Net Promoter Score (a measure of a customer’s intent to recommend) from contributed ratings and reviews from approximately 6,000 small businesses in North America. The Q4 2015 index has rankings for some website platforms including WordPress (73), Squarespace (11), Wix (-7) and Weebly (-13). This is a relatively small index when compared to BuiltWith and W3Techs, but interesting as it is more aligned to customer satisfaction than simply usage. Hopefully the team at Alignable will continue with this index over time. 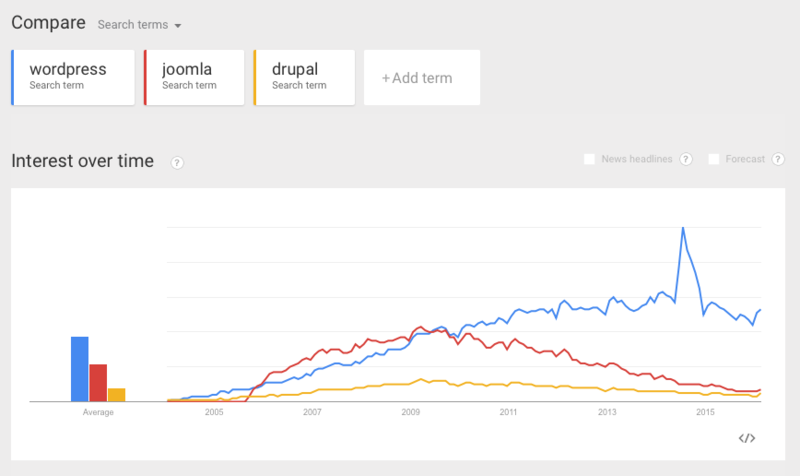 This detailed article from Smashing Magazine looks at WordPress, Drupal and Joomla and their use as a CMS: How WordPress Took The CMS Crown From Drupal And Joomla. And you can also read up on some other related articles below – these articles use different information sources from different periods, but the overall picture is the same – WordPress is a very popular CMS used for building websites.